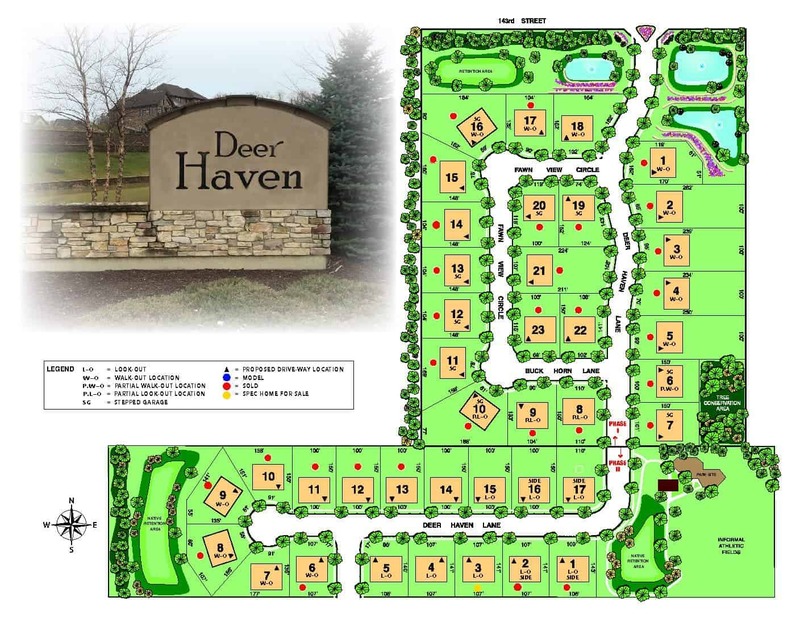 Deer Haven will consist of 40 custom built 2-story and ranch executive Dream homes located at 143rd Street, 2 blocks east of Wolf Road in Orland Park. The contour of the land will allow walk-out, look-out or standard basements depending on the location within the community. Choose a floorplan from our Dream Home series or design your own custom plan. Call us at 708-479-4497 for to discuss your custom home plans. You can also use the form below to get more information or request an appointment. Where is Deer Haven Estates? 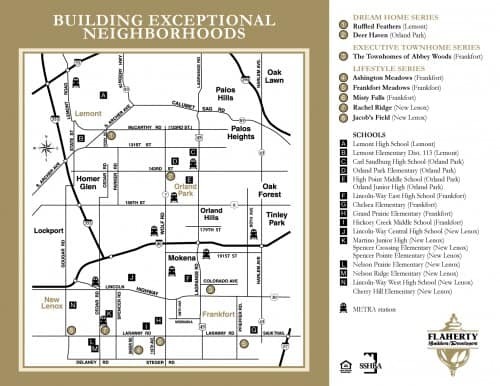 Deer Haven Estates is an upscale single family residential community consisting of 40 estate style lots with the ability to accommodate a variety of standard, walkout and lookout homes. Deer Haven is located in the heart of Old Orland Park on 143rd Street, and is just minutes from the new Main Street Triangle Metra Station and Crystal Tree Golf and Country Club. Individually designed and crafted custom homes set in the unique rolling terrain range from 4,000 to 7,000 square feet. Who is the developer /exclusive builder of Deer Haven Estates? 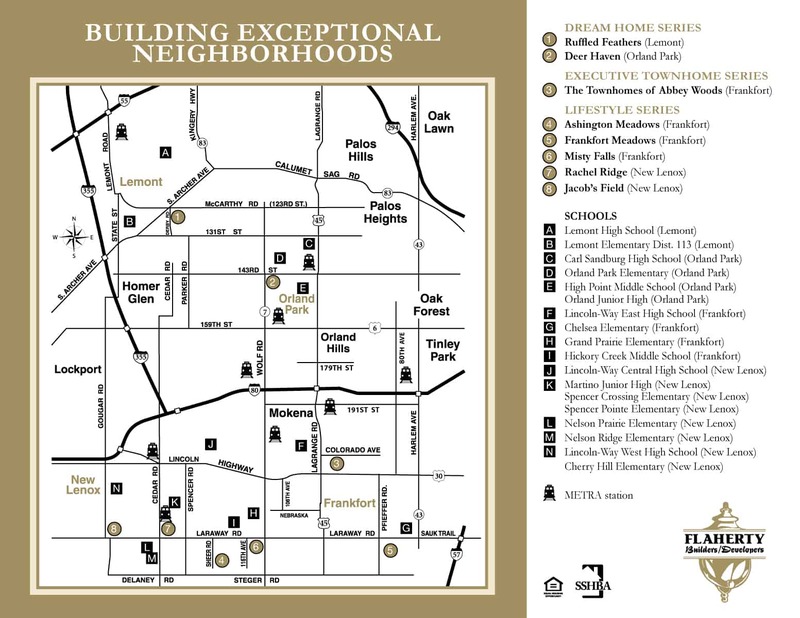 The Deer Haven Estates subdivision is being developed by DHE Development, LLC, a Flaherty Builders related company. Flaherty Builders is a 2nd generation family owned and operated residential development and construction company. Our commitment to quality is on display at each of our communities where we have won numerous awards for our homes. 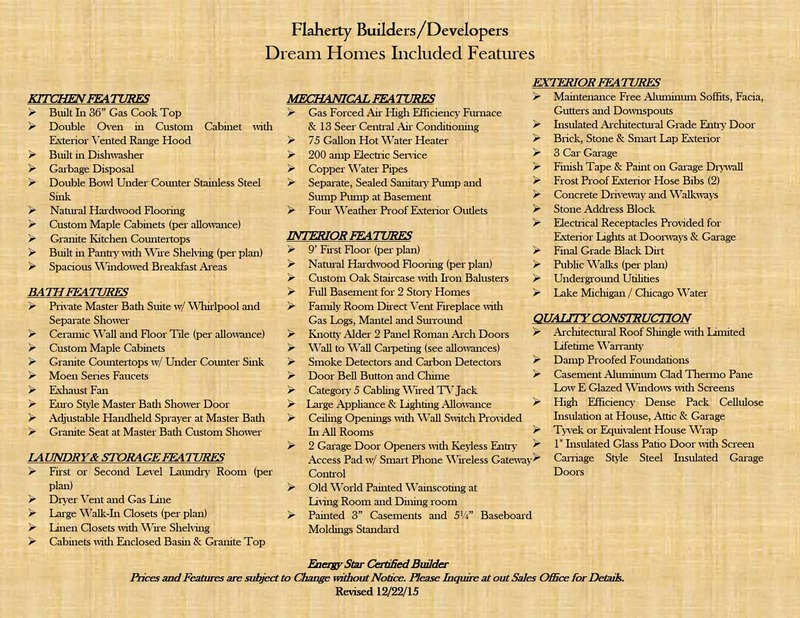 Flaherty Builders will be the exclusive custom home builder for the community. Each home will be individually designed and crafted to meet each home buyers exacting standards. How do I secure my lot, what is the process of getting my home built? Flaherty Builders will utilize their exclusive Design/ Build program for this project. Simply select a lot and put down a refundable lot deposit. Once a lot is secured, you will meet with Flaherty Builders’ project manager to begin the design process for your new home. Once a conceptual plan is in hand, Flaherty Builders will provide a detailed proposal to construct your home. Will there be a Home Owners Association? Yes, the common elements such as the ponds, common grounds and landscaping will be managed by the Deer Haven Estates Home Owners Association (DHEHA). The DHEHA will be controlled by a board of directors. The developer will appoint the initial Board and upon the turnover of the association, subsequent boards will be elected by the lot home owners. The DHEHA will be professionally managed and an annual fee will be assessed to cover the maintenance expenses of the DHEHA. Is there a “Covenant and Restrictions” document in place? Yes. The Declaration of Covenant and Restriction will be sent with the contract and related documents for your review, after your lot reservation is completed. Are their lookout and walkout lots available? Yes, please refer to the site plan for lookout and walkout locations. Construction premiums are associated with all lookout/ walkout and side load conditions. Please see the sales professionals for details. Interested in Deer Haven? Use this form to ask us a question or request an appointment.